After spending untold amounts of money battling the creation of the bureau, Capital One finds itself the first victim. The financial sector went all-out against the creation of the Consumer Financial Protection Bureau in 2010, and against its implementation ever since—and Wednesday, we saw a case study on exactly why. The CFPB announced a $210 million fine against Capital One Bank for deceptively marketing credit-monitoring services to credit card customers. (In the interest of full disclosure, I was one of those customers). 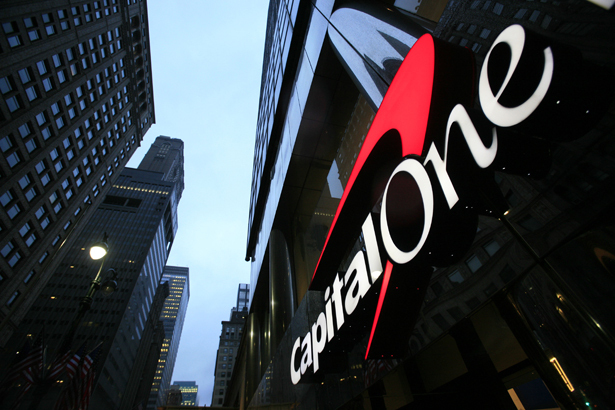 Capital One must pay $140 million to the customers, who paid for the credit-monitoring after being told it was mandatory, or that there was no cost. The bank must also pay a $25 million fine to the CFPB and $35 million to the Office of the Comptroller of the Currency. Publicly, bank officials were contrite today. “These marketing calls were inconsistent with the explicit instructions we provided to agents for how these products should be sold. We apologize to those customers who were impacted and we are committed to making it right,” said Ryan Schneider, president of Capital One’s card business, in a statement. Representative Bachus is chair of the House Financial Services committee, which has held numerous hearings since 2010 painting the CFPB as an out-of-control bureaucracy. It has also advanced several pieces of legislation that would neuter the CFPB. Bachus has said the role of Congress is “to serve the banks,” and repeatedly went after the CFPB as allegedly too powerful. The other three are members of House GOP leadership and have repeatedly savaged the bureau—Boehner, for example, has said it’s “bad for jobs and bad for the economy.” They lead the passage of a bill in September 2011 that would remove the position of CFPB director and replace it with a five-person, bipartisan board. (A recipe for gridlock and inactivity if there ever was one). And these are just the public, direct donations through the bank’s PACs and employees. It is also a “national level” member of the US Chamber of Commerce, which as Ari Berman documented last year in The Nation, led a $2 million campaign against the CFPB. Capital One is also a member of the Financial Services Roundtable, American Bankers Association and several other industry groups that actively lobbied against the CFPB. The bank’s 2011 policy affairs report notes that it actively tracks Dodd-Frank implementation. It isn’t news that Capital One and other banks deeply oppose the CFPB, but today is a good example of why they were afraid—now that the bureau is up and running, it’s calling banks on malfeasance that they can’t deny, and must even apologize for. They would have no doubt preferred there was no cop on the beat in the first place. This dynamic figures to be a central issue in the Massachusetts Senate race between Elizabeth Warren and Scott Brown, as Ryan Grim notes today. Warren is responsible for the creation of the bureau and can herald this accomplishment. Brown, meanwhile, is one of the top Senate recipients of Capital One cash.